We understand the value of text messaging, and we appreciate what it is capable of doing for anybody’s business in terms of increased sales and higher profits. We also believe that everyone at every step of the process is a valuable asset to all parties involved. That is why we created an affiliate program that offers huge incentives to YepText affiliates. There are no cheap gimmicks here. YepText quite simply provides you with only the most vital information necessary, so you can spend your time focusing on acquiring more clients and increasing your profits. 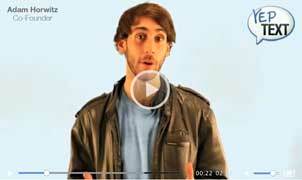 Watch this quick video to see how you can make a killing by becoming a YepText affiliate! The table below illustrates potential profits for the various plans on YepText. * Higher volume plans available. Not shown in this estimation. • You will get your own unique promo code – your referrals will save money on their first purchase by using your referral code. • Your clients will get the best rates in the industry. • YepText stores cookies for 180 days. •	Affiliate dashboard that is easy to navigate. •	Just the essentials, no nonsense or gimmicks. • Links that can be traced, banners, and other promotional material. • Dashboard for you to administer and monitor your performance in real time. • A design team that can help you create customized material for your marketing campaigns. • Online demos and training videos provided by an experienced representative. • Tell us anything else that we can do to help. We are open to new ideas.